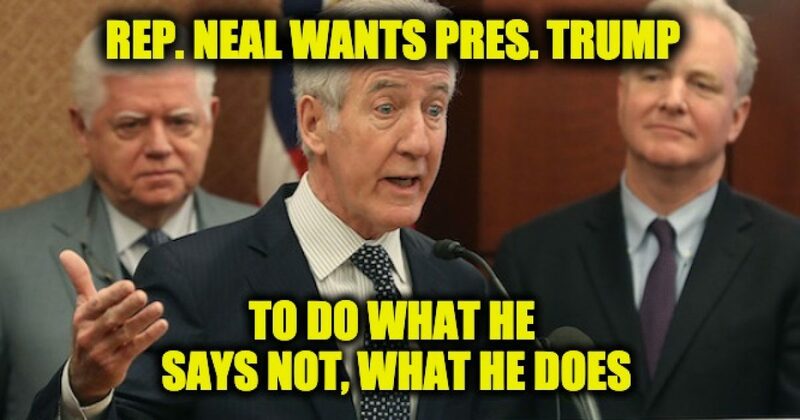 Hey Rep Neal, Where’s YOUR Tax Return? Congressional Democrats are now going after President Trump’s tax returns. It’s their latest attempt to punish President Trump for beating Hillary Clinton and for ruining their favorite conspiracy by not colluding with the Ruskies. The hypocritical part of the Democrat’s request is same members of Congress asking for Trump’s returns have kept their own returns a secret despite a request from reporters from a major D.C. newspaper covering Congress, Roll Call. On Thursday, House Ways and Means Chairman Richard Neal (D-MA) sent a letter to IRS Commissioner Charles Rettig, asking for Trump’s personal and business returns for 2013 through 2018. He asked for the documents in seven days, setting an April 10 deadline. If releasing tax returns is so essential to Rep. Neal, why doesn’t he release HIS tax returns to voters? He didn’t he even respond to Roll Call when they asked for his tax returns in 2017. Rep. John Lewis (D-GA) also on the committee didn’t release his returns or respond to Roll Call. In total, seventeen out of twenty-five Democratic members of the committee asking the IRS for Trump’s tax returns didn’t share theirs. Earlier this year Nancy Pelosi said she believes the people want to see President Trump’s returns. Aaron Rupar who tweeted the above is a reporter for the liberal website Vox should know that major audits sometimes take much longer. For example, when the IRS audited S.I. Newhouse’s estate returns which were prepared after his death in 1979, they wanted another $609.5 in taxes based on how they estimated the value of his estate. The Newhouse lawyers and accountants felt the IRS was wrong tried to negotiate the demand away, that took a few years. Eventually, it went to court where it took another seven years for a Judge to resolve the battle (in the Newhouse’s favor). That truth probably escapes the Democratic hate team. House Intelligence Committee Chairman Adam Schiff announced his committee would undertake an investigation into whether the President interests are driving his actions. Schiff said the inquiry would “allow us to investigate any credible allegation that financial interests or other interests are driving decision-making of the President or anyone in the administration.” Schiff is another one who refused to release his returns or respond to Roll Call. I for one will love to learn if he is getting paid to leak all that secret anti-Trump data. Right now there is no law saying a presidential candidate, president, or even member of Congress has to release their tax returns, but they do have to issue a financial disclosure annually. President Trump’s most recent disclosure form was released in May 2018 and is required to release another one in 2019. The President has said he would not release his tax returns until the IRS audits of his tax returns were over. While there is no rule against him releasing tax returns while under audit, after consulting a few CPAs I learned that any CPA or Tax Attorney who allows a client release his tax returns while under audit should lose their license to practice (whether or not they are the years being audited). When someone as wealthy as President Trump is audited there is likely a team of people at the IRS going through the audited years’ returns looking for something to nail the taxpayer with. But when that same wealthy candidate releases tax returns the IRS auditors are joined by the opposition party, newspapers, magazines, tv networks, bloggers, etc. If the media finds a mistake in a year, the IRS isn’t auditing the IRS can add that year’s return to the audit. Also, keep in mind the fact someone’s return is being audited doesn’t mean the IRS has found something. There are certain red flags that make IRS audits more likely. For example, if someone claims to have a home office, they are more likely to be audited, not because that taxpayer’s claim is illegitimate but because many people do file false claims of a home office. And as explained in the example given above, audits of wealthy people with diverse holdings are very complicated and may take a long time. The real truth is the hypocritical Democrats are upset that their hero Mueller came up with nothing, and are merely trying to find a different way to prevent Trump’s agenda from being enacted, and to prevent him from being reelected.